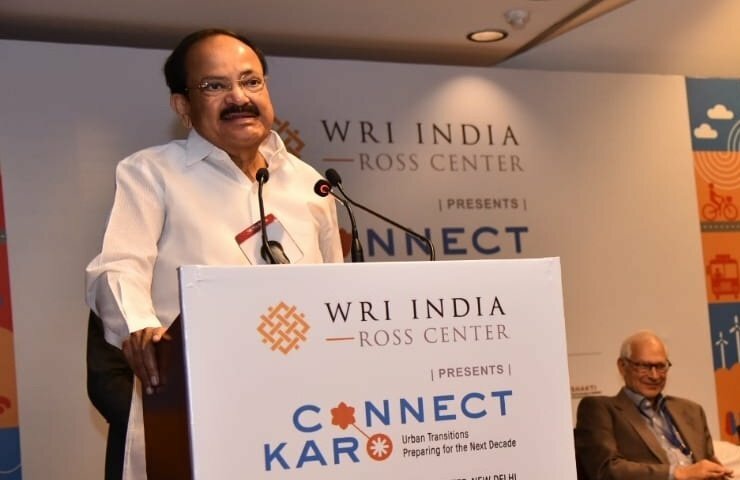 Terming climate change as the most common challenge faced by the world,Vice President M Venkaiah Naidu today said that the best way to face climate change is to be friendly with nature and live in harmony with it. Addressing an event her today, Mr Naidu said, as people brace themselves to cope with the challenges of climate change, everyone have to marshal all the intelligence, knowledge, science and understanding of nature to do that. Saying that India’s commitment towards renewable energy sources had led to the setting up of the International Solar Alliance, the Vice President said that the sector has the potential to create new jobs for men and women across India, contributing to the overall GDP of the country even as we find solutions for complex problems of clean energy. He also called for the urgent need to take systematic measures to improve air quality as it adversely impact the health and well-being of city residents, especially our children. He said, shared mobility systems, electric vehicles, bicycles and connected vehicles are beginning to occupy center stage in the global mobility systems. Mr Naidu said, these are welcome changes and it will have an impact of reducing traffic congestion, cleaning up the air and reducing the need for parking space. The Vice President said, the air quality has been a matter of concern and every winter many parts of the country face ambient air quality that is extremely poor. He said, it cannot be allowed to go on. Mr Naidu said, there is need to systematically identify the sources of the problem and deal with them, otherwise it will adversely impact the health and well-being of city residents, especially the children. M. Venkaiah Naidu has said that farmers were critical for the well-being of the nation and they play a huge role in ensuring and maintaining home grown food security in India. He was delivering the keynote address at the annual event ‘Connect Karo’, organized by the WRI India, here today. The Vice President said that collective actions were needed to correct development strategies to include preservation of nature. Talking about the serious impacts of Climate change, he opined that it was necessary that government, people and the private sector join hands to restore the balance that had wittingly and unwittingly disturbed. Opining that everybody has stakes in the survival of the civilization, Shri Naidu called for constructive people’s movement on initiatives such as tree plantations, keeping surroundings neat and clean, educating the women and girl child, changing lifestyles to avoid the disease burden and others to correct the maladies in our society and to make our civilization environmentally sustainable. School children must be taught about the importance protecting and preserving the nature right from their school days, he added.